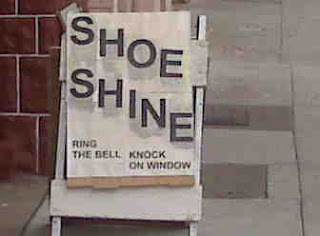 Mission on Mission: Shoe Shine Anyone? Recently I’ve been asked how I’m making my way to each bar on my Mission on Mission. I've been walking from my house to the next bar along my journey but this will soon end as La Terraza was .76 miles from my house and eventually I will be forced to leave pretty early to make it to the next location by 6pm. Alternate modes of transportation will have to be considered as I get dropped off at my last location to walk to the next. I’m not a big public transportation guy so this may pose a challenge. I’m comfortable driving but maybe this is an opportunity to conquer a fear of mine. Not really a fear more of a challenge to finally learn about San Francisco’s bus system. This may take some time and a lot of research. These walks have provided me a time of reflection on the places I’ve visited and time to psych myself up to enter a strange new door that awaits me. This is much like a prize fighter making his long walk from the bowels of the stadium to the ring with loud theme music playing to a cheering crowd. You, reader, are my crowd. I can hear you with every step I take. What’s my theme music? I’m going to pick “Down in Mexico” by The Coasters because that's where I've been the last few weeks on this journey. I haven’t seen much on my walks but did come across an interesting little service last Friday, Shoe Shining at 3611 Mission Street. I wore sneakers so I couldn’t take advantage of it but just knock on the window and someone will come out to the garage and shine your shoes. The garage door is open and there awaits a shoe shine chair. I’m thinking this is the first stop for all the Mariachis making their way down Mission Street with their large hats, guitars, sparkly suits and of course shiny cowboy boots. I will visit the shoe shine person at some point and am still looking for the traveling food guy. Stay tuned.